Posted on the Nation 26th January 2018. Last week Turkey opened a new front in the Syrian war by using its air force against the Syrian Kurdish canton of Afrin—which had done absolutely nothing to provoke this attack—even while the battle against ISIS continues in Deir Ezzor, where the Syrian Democratic Forces (SDF), led by the Kurdish YPG-YPJ, are fighting with US support. Turkey’s attack on the Syrian Kurds has opened up a new front in the war, jeopardized its already fragile relationship with the United States, and given a green light to jihadis to attack the Kurds. Turkish President Recep Tayyip Erdogan, who announced that his “Operation Olive Branch” would “destroy all terror nests” within days, launched a ground offensive on Sunday, January 21 that included tanks, special operations troops, and militias of the Free Syrian Army. Though the ground offensive was stalled, Turkey is still heavily bombing; so far at least 24 civilians have been killed and an estimated 5,000 have lost their homes. The displaced have nowhere to run, since Turkey has built a wall along the border and those who reach Aleppo are turned back at Syrian government checkpoints. Meanwhile, at home Erdogan is arresting any journalist or politician who dares criticize the offensive on social media—91 and counting. Afrin is the westernmost canton of what is often called by the Kurdish name Rojava; the other two cantons, Cizire and Kobane, were originally separated by ISIS-controlled territory but by spring of 2016 they were linked; that August Kurdish and Arab fighters in the SDF drove ISIS out of Manbij. The cantons are under the ideological leadership of the Democratic Union Party (PYD), but are run by a diverse, multi-party umbrella body known as TEV-DEM. In December 2016, to highlight its commitment to pluralism rather than Kurdish identity politics, Rojava changed its name to the Democratic Federation of Northern Syria. Until now, Afrin, which is famous mainly for olive-oil soap, has been one of the more stable parts of Syria; for this reason, despite a Turkish embargo, it became the destination of hundreds of thousands of refugees, who increased its population from 400,000 before the war to roughly 750,000 now. Afrin borders Turkey on the north and is surrounded on its other sides by Syrian government forces and rebel forces including Al Qaeda. Like other parts of Rojava, Afrin is run democratically, with an emphasis on religious and ethnic pluralism, restorative justice, the liberation of women, ecology, and economic cooperatives. It has been an open question how long the military alliance between these Kurdish radicals and the United States would last once the battle of Raqqa was won and ISIS was driven out of most of Syria. To convince the SDF—who lost at least 650 fighters in Raqqa—to lead that battle, the United States promised future support. These promises appeared to bear fruit on January 15, when Washington announced that it would continue to support a military force of 30,000 on Rojava’s borders with Iraq and Turkey, and also along the Euphrates River, which separates Rojava from territory controlled by the Syrian government. Erdogan, predictably, went ballistic. “A country we call an ally is insisting on forming a terror army on our borders,” he said. “Our mission is to strangle it before it’s even born.” Moscow also objected; Russia is planning permanent bases in Syria, and there’s evidence Iran is too. Neither of them want the United States to do the same. According to Sinam Mohamad, diplomatic representative of the Democratic Federation of Northern Syria, the Russians said they would protect Afrin only if the Kurds turned it over to the Assad government. 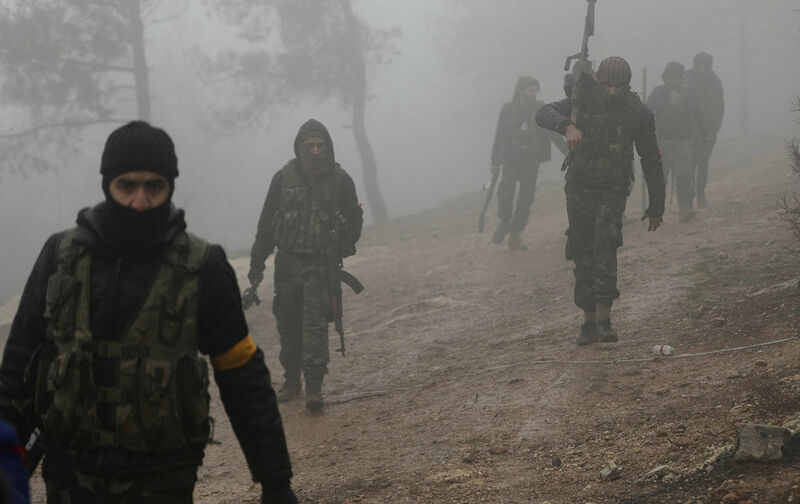 As Timur Akhmetov, an analyst with the Russian International Affairs Council, explained to Ahval News, a democratic exile Turkish news service, the transfer of Afrin to the Syrian government was vital so Russia could show the Kurds elsewhere in Syria “that they can have formal self-rule while keeping the Syrian government in charge of security and borders.” The point was to tell the world the Syrian Kurds need Damascus to survive. When the YPG-YPJ indignantly rejected their offer, Russia pulled out its troops, thus effectively giving Turkey the green light. This betrayal has probably finished Russia’s projected peace talks at Sochi; the Democratic Federation of Northern Syria, at least, will almost certainly not participate. Turkey’s stated aim is to create a 30-kilometer buffer zone on its border with Rojava—a need that Turkey never seemed to feel when ISIS was in control of that region. The zone is supposed to prevent the YPG-YPJ from attacking Turkey, though they have repeatedly said they wouldn’t do that anyway. Of course, Erdogan is really worried that Rojava’s success as a self-governing entity might be a bad example for Turkey’s own Kurds, who, under the leadership of the Kurdistan Workers’ Party (PKK), have been resisting the government for 40 years, first as a guerrilla movement seeking independence and then, since 2005, as a movement for autonomy and democratic rights. Under these circumstances, a buffer zone will hardly be enough to make Turkey feel secure. In fact, nothing is likely to make Turkey feel secure until it becomes willing to see its Kurds as citizens with rights rather than as an existential threat. We are in Erich Fromm country here, dealing with deep irrational phobias that are fanned and exploited for political ends. As Turkey’s economy tanks and its political isolation increases, these political ends include maintaining Erdogan’s increasingly authoritarian rule. A little war might make him seem indispensable. And Afrin must have seemed like an easy win for this huge military power, with its fancy German tanks and US warplanes and missiles. Turkey has already shown its willingness to inflict “massive destruction, and numerous other serious human rights violations,” including heavy damage to the cities of Nusaybin and Cizre and the Sur district of Diyarbakir, according to the UN. But the Kurds have said they will fight to the death before they give up an inch of Afrin, and though YPG-YPJ fighters in Afrin do not have US tanks or anti-aircraft guns, they are still a formidable force, seasoned by years of combat with ISIS. Meanwhile, much of Turkey’s former military command was jailed or dismissed after the failed coup of July 2016, and FSA militias have yet to defeat the Kurds. These factors throw doubt on Turkey’s promise to clean up Afrin in a few days and then drive on to take Manbij, a strategic point currently held by SDF forces backed by US military advisers. Is Erdogan really ready to take on the Pentagon? Sinam Mohamad and other Kurdish representatives are calling on the United States to declare a no-fly zone over all of Rojava, including Afrin, emphasizing the key role played by their troops against ISIS and the importance of their pluralistic model to future stability in Syria. At the moment, Washington appears to have two conflicting foreign policies: The White House wants to appease Turkey, and the Pentagon wants to support the Kurds. And what should US progressives support? With the defeat of the Syrian civil opposition, the Democratic Federation of Northern Syria is the only location of anything that looks like democracy, let alone feminism, in the region; as such, they deserve—and need—all our support. But Washington has a history of supporting Turkey’s most repressive tendencies. The CIA was the architect of Turkey’s deep state; the State Department put the PKK on its terrorist list in 1997, and Washington organized the capture of PKK leader Abdullah Ocalan in 1999. In 2002—after the PKK renounced terrorism—the European Union put the group on its terrorist list; the UN still doesn’t list the PKK as such. Moreover, the United States and Europe have consistently supplied Turkey with weapons used against the Kurds. This Cold War–style alliance has become increasingly uncomfortable as Erdogan evolved into a dictator who supported Syrian jihadis opposed by the United States and took the road of extreme domestic repression, bloody attacks on his own citizens, Islamization, and widespread corruption. Now Erdogan is encouraging nostalgia for the Ottoman Empire, clearly hoping to incorporate parts of Syria. Any prospect of regional stability, let alone commitment to justice and democracy, are completely at odds with Turkey’s goals at this point. Rather than soothing Erdogan, the United States should induce him to stop persecuting the Kurds in Syria and Turkey and re-open negotiations with the PKK, as well as return Turkey to a condition approaching democracy. In the long run, the ethnic nation-state model is long overdue for a change, and support for the federalist approach to governance proposed by the Kurds is the clearest path forward in countries as heterogeneous as Syria, Iraq, and even Turkey. Even if Washington is not able to recognize that, we should.